Orchid is the most saturated hue in the pastel palette. Evolving from lighter shades of lilac, orchid embraces bright purple tones. Dark salmon brings something new to the pastel palette, with coral undertones. This season, bluebell is one of the most essential hues of the season. Tones range from a cloudy shade to a slight aqua undertone. Buttermilk offers a creamy yellow pastel in contrast to the more saturated daffodil. Subtropics explores a well-rounded palette of mid-tones. Warm colors like lava, Indian red and chili powder apply orange and red undertones, adding spice to the group. Crimson red remains relevant along with oasis, this season’s teal hue. Yellow is featured in marigold and a brown cast mustard seed. Other fashion colors include cerise pink, purple rain and juniper green. Syrup is offered as a new warm brown hue. The teal conversation continues to be relevant with this season’s oasis. Shades of copper have become a major focus over the past several seasons, evolving to a warm chili powder. The Shore palette features faded mid-tones that borrow from the scenery of the Northern California coast. A complete range of new neutrals brings newness to the group, including tawny, bisque, hay stack and taupe. Brittle enters as a warmer Spring alternative to camel. Tones like sea glass, dove and lavender grey give off a cloudy, yet soft feeling. Antique white fits right in as a weathered alternative. Periwinkle is the brightest color in the Shore palette, evolving from a softer chambray hue. Antique rose brings something fresh to the traditional range of pinks. As a mid-tone, the color is fully saturated and looks best when paired with delicate materials. Dusk features jewel tones as well as dark, rich neutrals. Familiar favorites include maroon and ivy, while on the base end of the conversation, olive and navy remain powerful. Blue alternatives include an intense shade of indigo, as well as deep sea, which signals that teal shades are still relevant. Brown tones include cacao and sludge. Mulberry, ivy and army round out the fashion color offering for the palette. Olive remains a power player, though it becomes darker this season. After the past few seasons with burgundy at the forefront of the jewel palette, maroon emerges with slight brown undertones. Lemons are tiny, oft-ignored powerhouses which can single-handedly transform our bodies, skin, and hair, for the better. Be it in the form of a potent, vitamin-rich juice consumed orally, or in the form of pulp applied topically, the fruit has a myriad uses. Highlight hair with lemon juice. Too broke to get highlights at the salon? This tried and tested remedy works just as well! Just rub lemon juice on your tresses before stepping out in the sun. The juice's mild bleaching properties get activated by sunlight. Your hair will end up with natural, sun-kissed accents at almost no cost, and without any harmful chemical treatments. Lemon juice is a great skin softener. Chapped lips? Hands rough as a tree's bark? Rub on some lemon juice, and wash off after 15 minutes. It smoothens and softens like no other. Just remember not to apply it on open wounds or scars which are fresh, or boy will it sting! Always follow this up with moisturiser, because lemon juice really dries skin out. Beat oily skin with lemon juice. Lemon juice soaks up excess grime and mattifies greasy skin like magic. Just don't apply it on cuts, inflamed skin, or pimples. Also remember not to rub it in too much, as it can irritate skin. Few toners work as well as lemon juice. 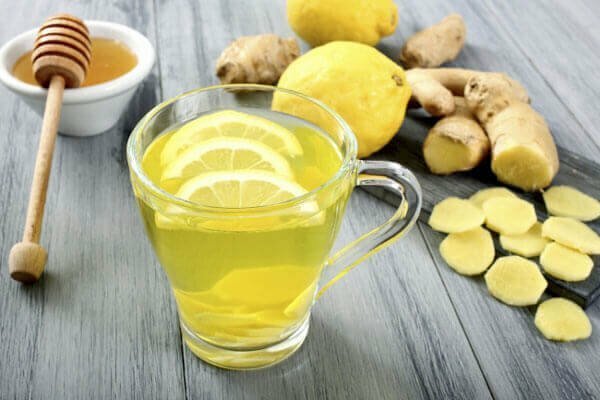 Green tea mixed with lemon juice is probably one of the most antioxidant-rich toners out there. Make small batches at home and cool it before applying with a cotton ball. The green tea to lemon juice ratio will depend on your concern and skin type. 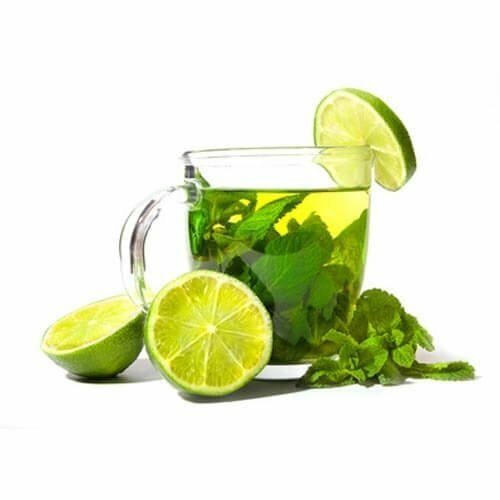 Oilier skin types can go with more lemon juice, whereas those with drier skin should opt for more green tea. This toner will soak up extra dirt and enrich skin. The glow you will wake up with the next day will explain what we're onto here. 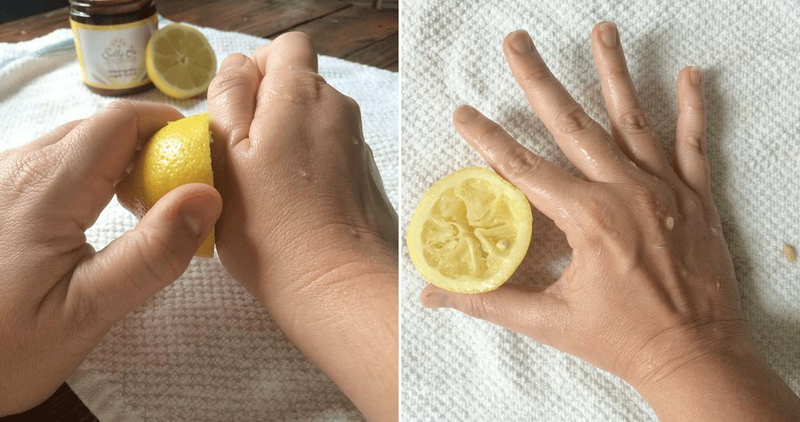 Buff off dead skin with lemon juice. Grey patches of skin on the elbows and knees are not always a consequence of sun exposure, and can be due to dead skin accumulation. Ditch the harmful skin-whiteners and exfoliate those pesky layers with some lemon juice and granulated sugar instead. Your freshly-scrubbed skin will glow. 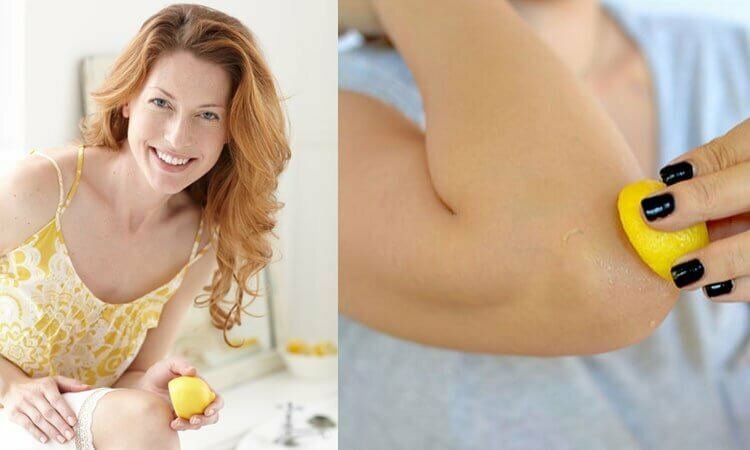 Combat scars and pigmentation with lemon juice. 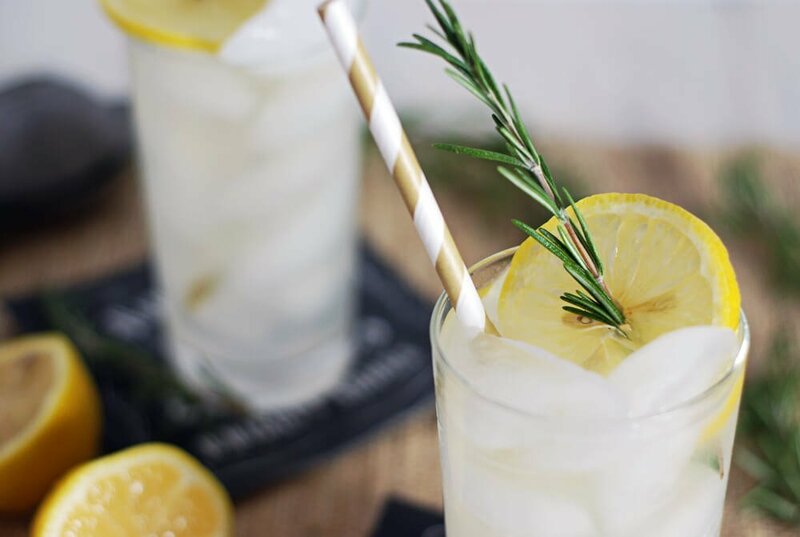 Lemon juice is well-known for its healing and brightening properties. The Vitamin C hydrates and repairs skin, so it can make scars disappear with unparalleled efficiency. Mix two parts coconut water and one part lemon juice to make a toner. Apply it on your blemishes and see the results for yourself. It's almost like a chemical peel! Lemon juice is a brilliant astringent. For those who have very oily skin which needs a potent astringent, this homemade remedy should work. Mix equal parts vodka and lemon juice and apply to cleanse and tighten oily, clogged pores. Do not try this if you have sensitive skin, as the alcohol and citric acid can be too harsh on your skin. Another plus side? You can drink this, too! Detoxify your body with lemon juice. Lemon juice can combat damage done by free radicals on the body, and improve skin health by removing a lot of toxins. Moreover, its atoms are similar to certain digestive enzymes which cause the liver to produce bile, the fluid that digests fats. This tricks the liver into performing its function of flushing toxins out of the body, and emulsifying fats. Thus, a shot of lemon juice every morning, is the only master cleanse you need. Speed up digestion with warm lemon-water. 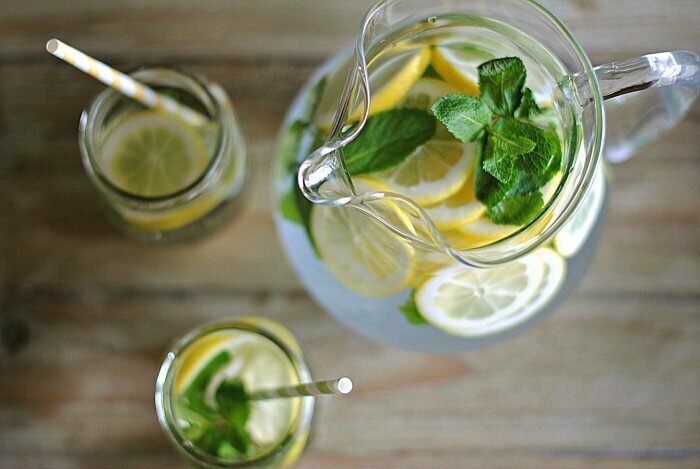 A glass of water water with lemon and honey helps speed up your metabolism by aiding waste-elimination from the body. This, in turn, leads to smoother bowel movements and better skin. The enzymes in honey aid digestion, and the lemon juice ensures better nutrient absorption by the body. Say goodbye to blackheads with lemon juice. 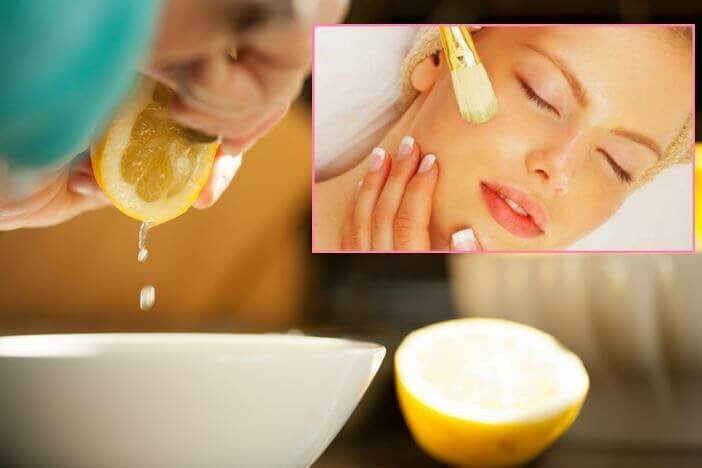 Lemon juice is great for removing dirt and oil, which are the primary causes of blackheads. Their astringent properties will help to gradually dissolve the dirt in blackheads, and remove them. Apply directly on the affected areas, and leave on for 15 minutes. Freshen sweaty armpits with lemons. Lemon juice makes for a great natural deodorant. It will smoothen armpits by removing dead skin, in addition to helping freshen up. Just store cool slices of lime in the fridge and apply. Remember to never do this on freshly shaved or waxed skin, or if you're about to expose the area to the sun. 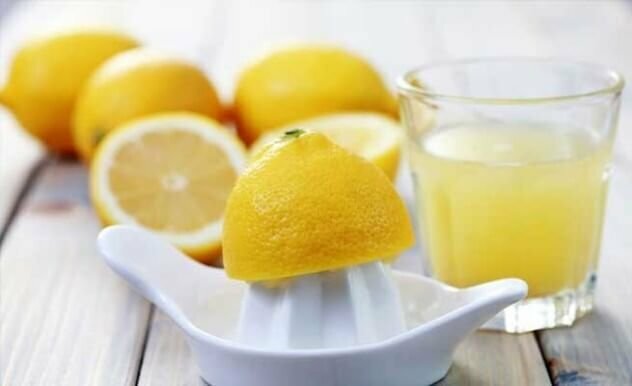 Whiten teeth with lemon juice. 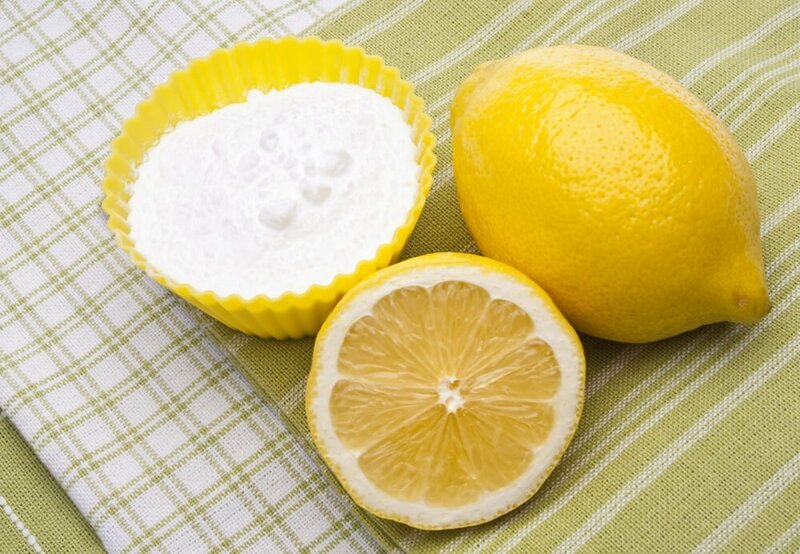 Mix baking soda and lemon juice and apply the paste on your teeth to whiten them, instead of taking a pricey trip to the dentist. Do a lemon juice pedicure. Lemon juice and sugar make an excellent foot scrub, but did you know that applying lemon juice on discoloured toenails can help bring their old sheen back? 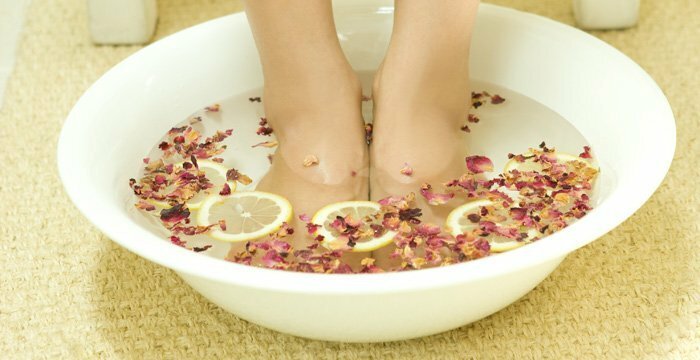 Soak your feet in a mix of warm lemon water and peppermint bath salts to give your feet a refreshing treatment. The antiseptic properties in lemon juice will help banish fungal infections under toenails, and deodorise your feet. Important things to remember when using lemon juice. 1. Do not step out in the sun after applying lemon juice as it can speed up sunburns. 2. 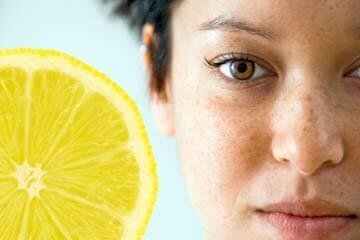 Lemon juice should not left on the skin for too long as it contains a chemical which can burn skin. 3. People with sensitive skin should avoid lemon juice. 4. Always follow up any application of lemon juice on your skin with a soothing and hydrating moisturiser, such as one containing Vitamin E and aloe vera. While lemon juice is very strong, this works both in its favour, and against it. Use it smartly, and sparingly, and you'll have had made the most of this wonder fruit. 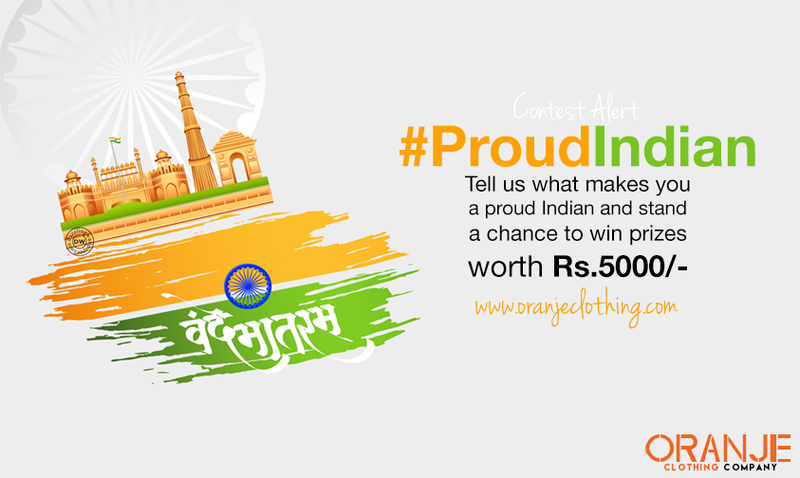 Use #ProudIndian and Tag Oranje Clothing in every Answer. At the end of the Contest, there will be 1 winner each on Facebook & Twitter, in the sole discretion of the Organizer, will be chosen, by way of lucky draw, as the lucky “Winner” during contest duration. Winners have to submit all details within 7 days of winner declaration. Details received after this period will not be considered. 1. To quickly assess an item’s quality, hold the fabric up to a bright light. Here’s an example of two different silk blouses held up against a strong light. “The thicker the material, the higher the quality,” Debbie Roes — creator of the Recovering Shopaholic blog — told BuzzFeed. 2. Do the “scrunch test” to see if clothes stay wrinkly. Ball part of the garment up in your fist, hold it for a few seconds, and then let it go. Does the fabric stay wrinkled or do the wrinkles come out quickly? If it can’t stand being wrinkled for a few seconds in your hand, it’s probably not going to withstand the test of time. 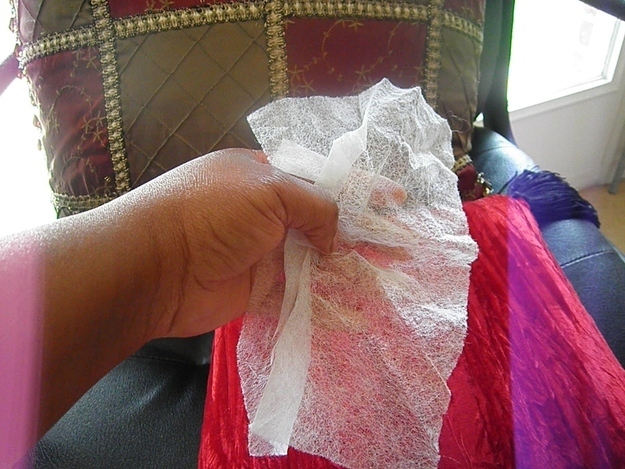 Gently tug on the fabric (this works especially well with a skirt or the bottom part of a dress) and then release it. Does the fabric retain its shape? Or does the material look altered? 4. When in doubt, shop in the men’s department. “Super thin, gauzy tops are currently a trend in women’s clothing,” Roes said. “This trend also allows designers to spend less money on materials for their garments.” If you’re looking for a shirt that’s NOT see-through, check out the men’s sections for tees and oversized button-ups with higher quality. Also, since menswear offers fewer clothing patterns, their items tend to be less expensive than the women’s equivalent. To learn more about what to buy in the men’s section, go here. 5. Avoid exposed zippers since they can be a sign of low quality. 6. Check to see if skirts and pants have decent hem allowances — especially if you’re tall. 7. And keep in mind that well-made pants have ~French~ seams. French seams are a favored seam-finishing technique for designers, Roes explained, since the raw edges of the fabric are hidden in a neat finished seam. 8. Always check the care instructions label for natural fibers. “Natural fibers like silk, cotton, and wool stand up to wear and tear better than synthetic materials,” Roes said. 9. Make sure your pattern matches at the seams. Check the side seams of a shirt and around any pockets to instantly tell if quality is high or not. “Matching a plaid or horizontal stripe may mean using more fabric to cut out the individual pieces of the garment, which can drive up the cost,” Roes said. 10. You should also check the seams to make sure all of the thread matches. “Quality top-stitching should be straight, in matching thread (unless the top-stitching is designed for contrast) and have a high number of stitches per inch,” Rose said. 11. You can almost always tell the quality of an item by the BUTTONS and the BUTTONHOLES. “Buttonholes should have tight stitching and a neat slot for the button to go into,” Roes said. Touch the button and make sure it’s tightly sewn on — and make sure there aren’t a lot of threads sticking out. 12. Gently pull the seams taut to see if there are gaps between the stitches. This quick trick can totally prevent you from wasting money on cheaply made clothes. “Better-quality garments have more stitches per inch and thus have tighter seams, which means there’s less of a chance to have the seam come apart,” Roes said. 13. Linings are always a *good* sign. “Well-made jackets have a taped edge holding lining to the jacket material,” Roes said. 14. If you’re trying to make sure an item is actually hand-stitched, make sure the seam stitching isn’t straight. “Stitches made with a sewing machine will result in straight, flat stitches,” according to Roes. If you’re specifically looking for a hand-stitched item in a thrift store, check to see if the stitches are on an angle or have a little ~flair~. 1. Break in your flats in under five minutes. 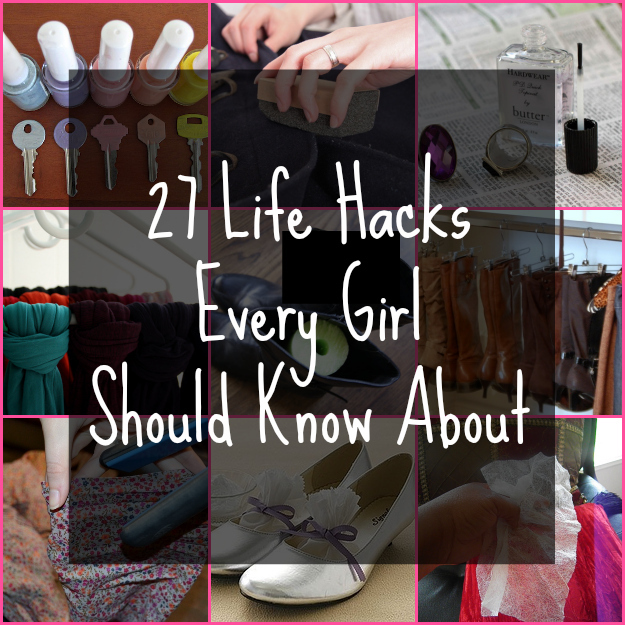 Step 1: Put on thick socks, and then your flats. Step 2: Blow-dry your shoes around the tight sections for a few minutes. 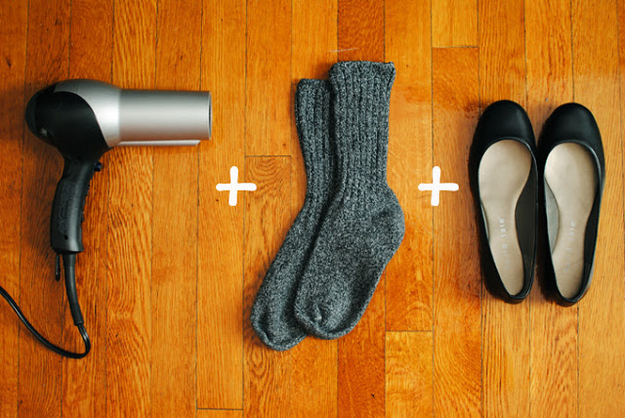 Step 3: Keep your socks/flats on while it cools. Step 4: Test them out; repeat process if you need them more stretched out. 2. 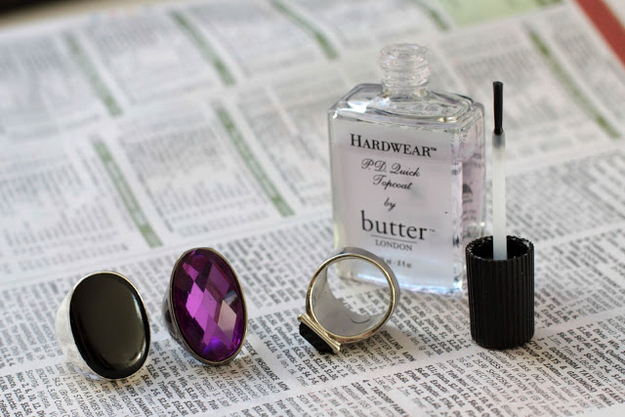 Put clear nail polish on the inside of your rings. Your fingers will be free from green stains. 3. 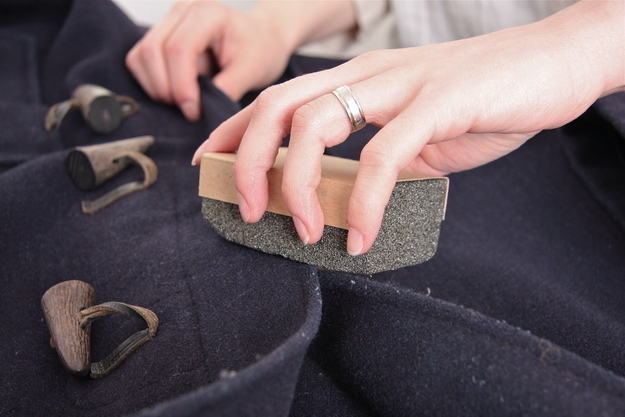 Use a pumice stone to de-fuzz a sweater. 4. 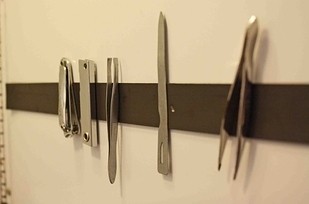 Hang your purses with shower curtain hooks. 5. 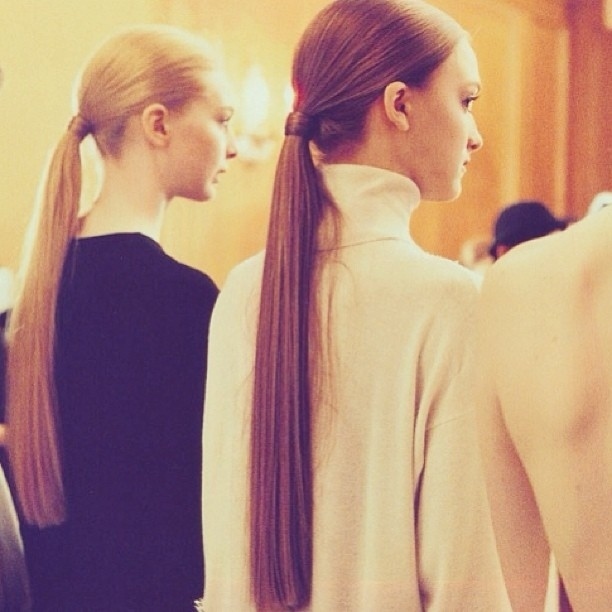 Wear loose ponytails to avoid bald spots. 6. 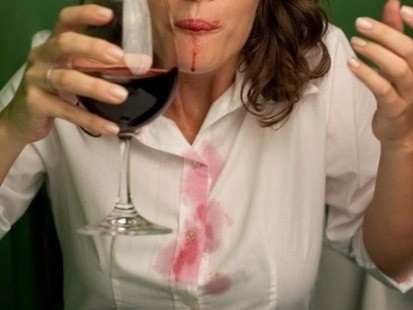 White wine neutralizes red wine stains. Yeah, you read that correctly. When you’re at a party and you accidentally spill some red wine on your blouse, immediately pour white wine over the stain and let it air-dry. The white neutralizes the red, making it easier to take out the stain. 7. 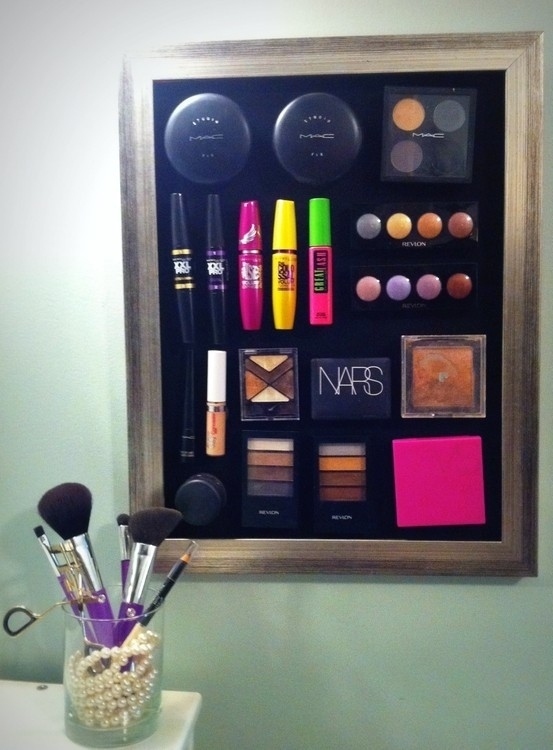 Store your makeup on a magnet board. 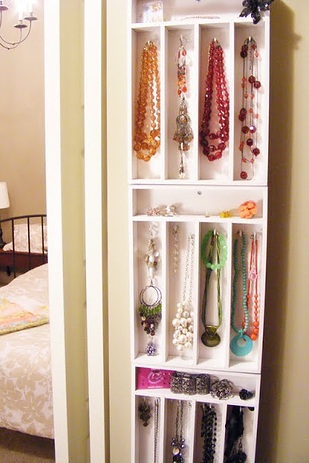 This is a good way to keep track of your makeup and stay organized. 8. Neatly tuck your non-skinny jeans in boots. 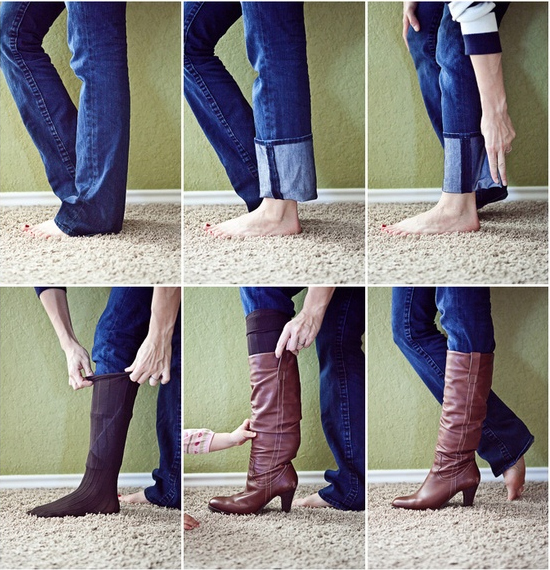 Just fold the bottom of your jeans and wrap it over to easily fit in socks. 9. 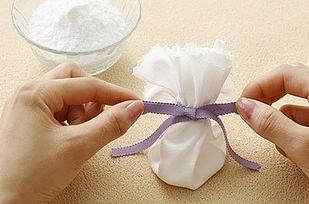 Remove deodorant stains with dryer sheets. Rub the marks in a circular motion and the sheets will absorb the deodorant. Make sure there’s no excess lint from the dryer sheet or you’ll end up with gray marks. Pantyhose also works! 10. 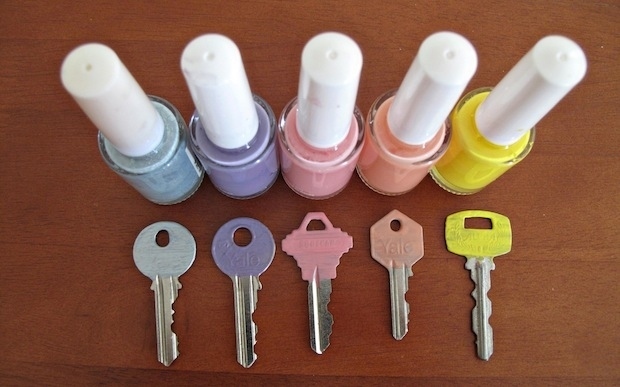 Paint your keys with nail polish to easily distinguish the sets. It especially helps when you lend a spare key to a houseguest. 11. 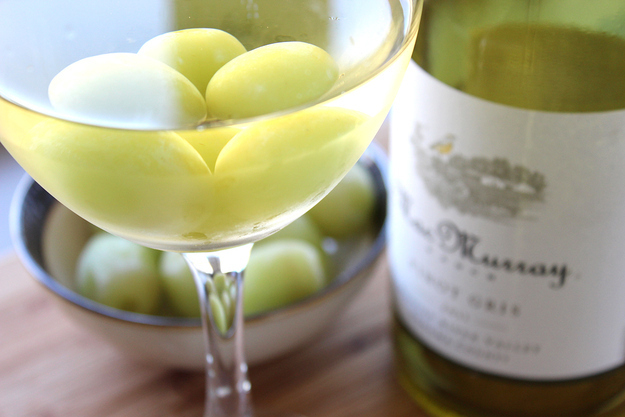 Chill your white wine with frozen grapes. This prevents the flavor from being watered down! 12. When you pack a suitcase, wrap your shoes in a shower cap. 13. 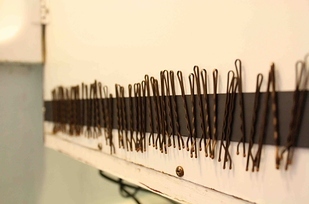 Add a magnetic strip in your bathroom cabinet to support bobby pins and tweezers. 14. 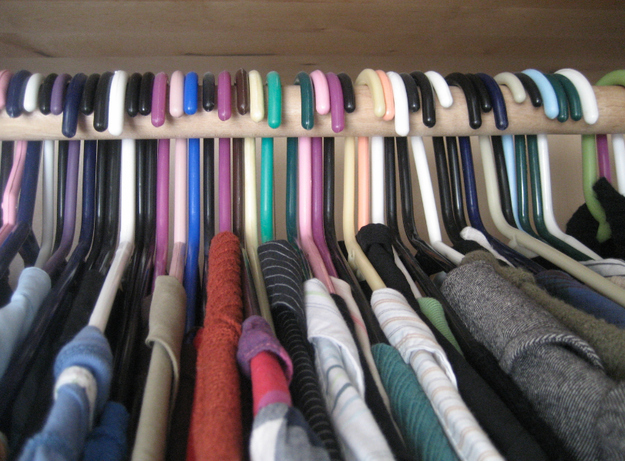 Turn around your hangers to clean out your closet. 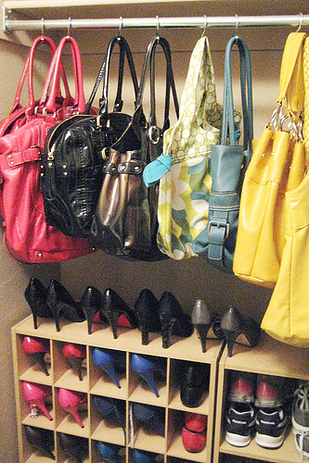 We all buy clothes we don’t wear, and it takes up unnecessary closet space. 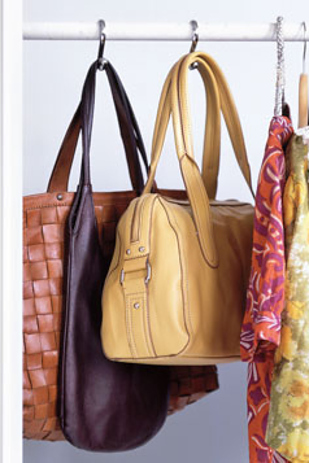 Place your hangers the opposite way, and after you use an article of clothing, hang it up regularly. By the end of the year (or season), donate the clothes that are still hanging backward. 15. 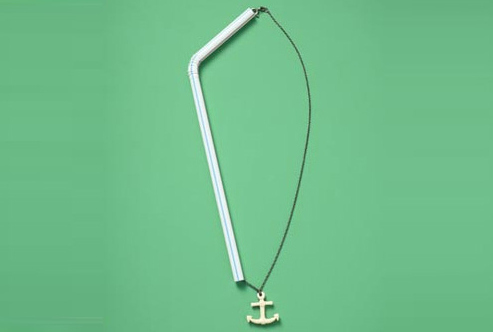 Put your necklace through a straw to keep the chain from tangling. It may look silly, but it will save you time and frustration. 16. 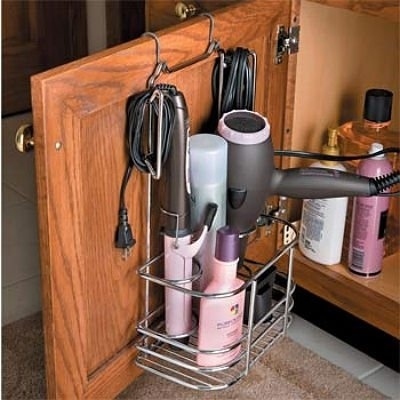 Use a caddy to store your hair appliances. You can also use PVC pipes! 17. 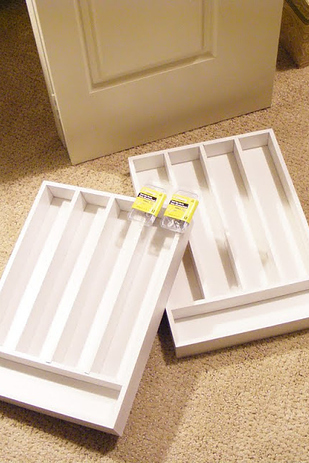 Mount cutlery trays to store your jewelry. 18. 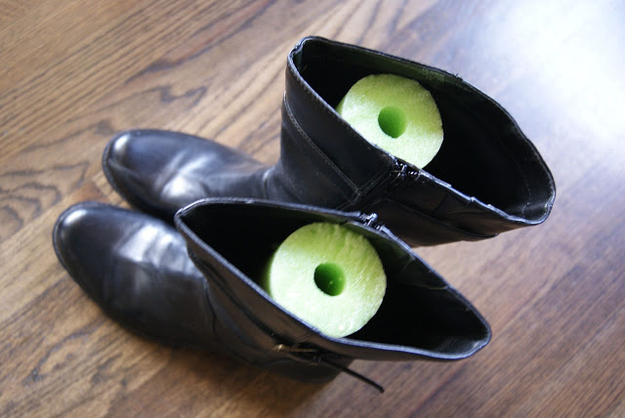 Put pool noodles in your boots to keep them upright. Newspapers and magazines work as well. 19. 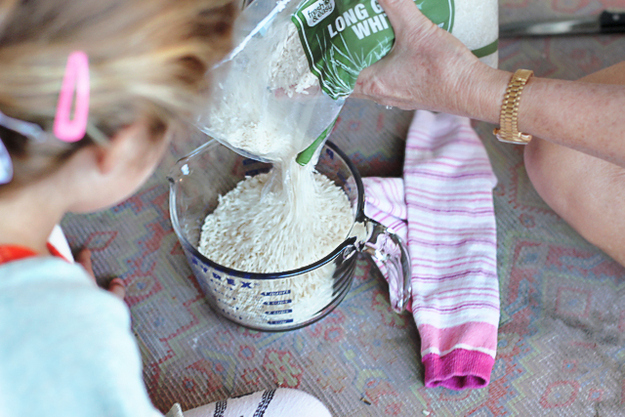 Use rice and a sock to make a DIY hot pack. Perfect for aches and pains. 20. 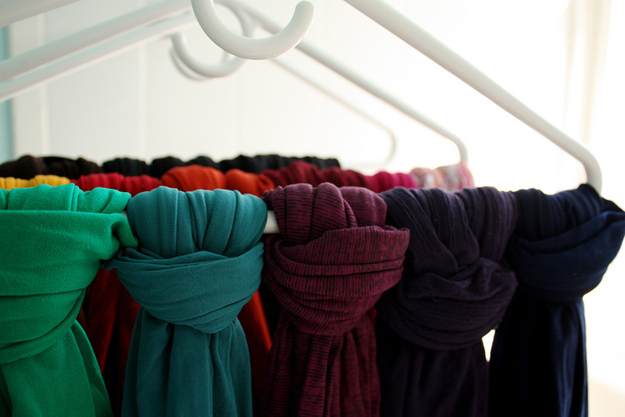 Tie your scarves and stockings to hangers for easy storage. 21. Use two fingers to test out your bra fit. If you can’t comfortably fit two fingers under the band of your bra, it is too tight. If you can fit your entire fist under the band, it’s too loose. 22. 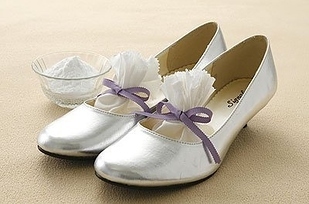 Put baking soda in your flats to avoid smelly shoes. 23. 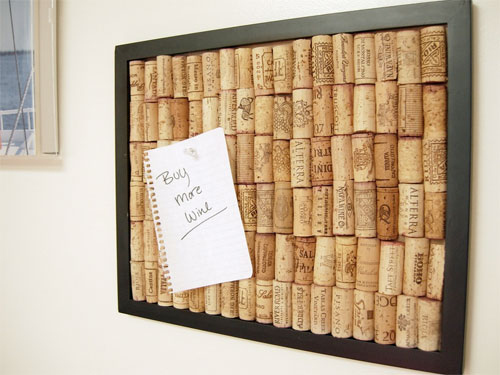 Glue old wine corks to a picture frame to make your own DIY corkboard. 24. 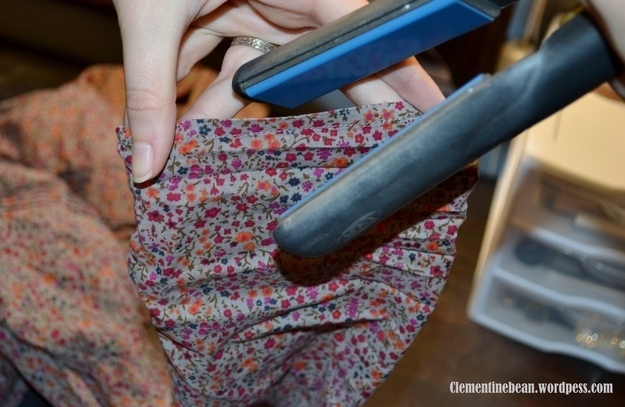 Use your hair straightener to iron hems. 25. Use clothing hangers to organize your boots. Just make sure they have sliding clips. 26. Run your mascara wand under hot water for easier application. Also, do NOT pump your mascara wand in and out of the tube — that causes it to clump. Twirl the wand inside the bottle before applying another coat. 27. 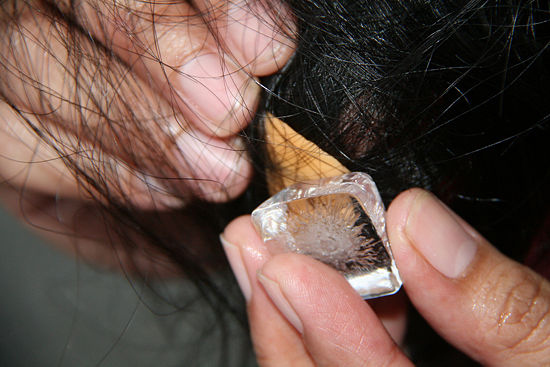 Use ice cubes to remove gum from your hair. It will harden the gum, making it easier to remove. You can also use this method for getting gum off the soles of shoes.